In Chapter 28 "The Nature and Regulation of Real Estate and the Environment", we noted that real property can be divided into types of interests: freehold estates and leasehold estates. The freehold estate is characterized by indefinite duration, and the owner has title and the right to possess. The leasehold estateAn estate whose termination date is usually known—a one-year lease, for example., by contrast, lasts for a specific period. The owner of the leasehold estate—the tenant—may take possession but does not have title to the underlying real property. When the period of the leasehold ends, the right to possession reverts to the landlord—hence the landlord’s interest during the tenant’s possession is known as a reversionary interest. Although a leasehold estate is said to be an interest in real property, the leasehold itself is in fact personal property. The law recognizes three types of leasehold estates: the estate for years, the periodic tenancy, and the tenancy at will. When the landlord physically deprives the tenant of possession, he has evicted the tenant; wrongful eviction permits the tenant to terminate the lease. Even if the landlord’s conduct falls short of actual eviction, it may interfere substantially enough with the tenant’s permissible use so that they are tantamount to eviction. This is known as constructive evictionConditions that interfere substantially enough with the tenant’s permissible use that it is tantamount to eviction., and it covers a wide variety of actions by both the landlord and those whose conduct is attributable to him, as illustrated by Fidelity Mutual Life Insurance Co. v Kaminsky, (see Section 32.5.1 "Constructive Eviction"). Explain how the landlord’s reversionary interest works and how it may be assigned. Describe the two ways in which a tenant’s leasehold interest may be transferred to another party. At common law, the interests of the landlord and tenant may be transferred freely unless (1) the tenancy is at will; (2) the lease requires either party to perform significant personal services, which would be substantially less likely to be performed if the interest was transferred; or (3) the parties agree that the interest may not be transferred. When the landlord sells his interest, the purchaser takes subject to the lease. If there are tenants with leases in an apartment building, the new landlord may not evict them simply because he has taken title. The landlord may divide his interest as he sees fit, transferring all or only part of his entire interest in the property. He may assign his right to the rent or sell his reversionary interest in the premises. For instance, Simone takes a three-year lease on an apartment near the university. Simone’s landlord gives his aged uncle his reversionary interest for life. This means that Simone’s landlord is now the uncle, and she must pay him rent and look to him for repairs and other performances owed under the lease. When Simone’s lease terminates, the uncle will be entitled to rent the premises. He does so, leasing to another student for three years. One year later, the uncle dies. His nephew (Simone’s original landlord) has the reversionary interest and so once again becomes the landlord. He must perform the lease that the uncle agreed to with the new student, but when that lease expires, he will be free to rent the premises as he sees fit. Why would a tenant be interested in transferring her leasehold interest? For at least two reasons: she might need to move before her lease expired, or she might be able to make money on the leasehold itself. In recent years, many companies in New York have discovered that their present leases were worth far more to them by moving out than staying in. They had signed long-term leases years ago when the real estate market was glutted and were paying far less than current market prices. By subletting the premises and moving to cheaper quarters, they could pocket the difference between their lease rate and the market rate they charged their subtenants. The tenant can transfer her interest in the lease by assigning or by subletting. In an assignmentThe tenant transfers all interest in the premises, along with all obligations., the tenant transfers all interest in the premises and all obligations. Thus the assignee-tenant is duty bound to pay the landlord the periodic rental and to perform all other provisions in the lease. If the assignee defaulted, however, the original tenant would remain liable to the landlord. In short, with an assignment, both assignor and assignee are liable under the lease unless the landlord releases the assignor. By contrast, a subleaseA transfer of something less than the entire leasehold interest. 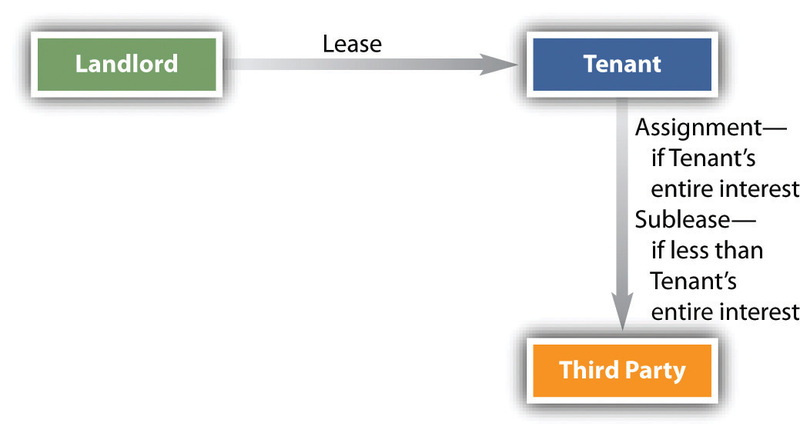 is a transfer of something less than the entire leasehold interest (see Figure 32.1 "Assignment vs. Sublease"). For instance, the tenant might have five years remaining on her lease and sublet the premises for two years, or she might sublet the ground floor of a four-story building. Unlike an assignee, the subtenant does not step into the shoes of the tenant and is not liable to the landlord for performance of the tenant’s duties. The subtenant’s only obligations are to the tenant. What distinguishes the assignment from the sublease is not the name but whether or not the entire leasehold interest has been transferred. If not, the transfer is a sublease. Many landlords include clauses in their leases prohibiting assignments or subleases, and these clauses are generally upheld. But the courts construe them strictly, so that a provision barring subleases will not be interpreted to bar assignments. The interests of landlords and tenants can be freely transferred unless the parties agree otherwise or unless there is a tenancy at will. If the tenant assigns her leasehold interest, she remains liable under the lease unless the landlord releases her. If less than the entire leasehold interest is transferred, it is a sublease rather than an assignment. But the original lease may prohibit either or both. What is the difference between an assignment and a sublease? Are the duties of the tenant any different if the reversionary interest is assigned? Suppose that Simone is in year one of a three-year lease and that Harry is the landlord. If Harry assigns his reversionary interest to Louise, can Louise raise the rent for the next two years beyond what is stated in the original lease? In Chapter 28 "The Nature and Regulation of Real Estate and the Environment", we discussed the tort liability of the owner or occupier of real estate to persons injured on the property. As a general rule, when injury occurs on premises rented to a tenant, it is the tenant—an occupier—who is liable. The reason for this rule seems clear: The landlord has given up all but a reversionary interest in the property; he has no further control over the premises. Indeed, he is not even permitted on the property without the tenant’s permission. But over the years, certain exceptions have developed to the rule that the landlord is not liable. The primary reason for this change is the recognition that the landlord is better able to pay for repairs to his property than his relatively poorer tenants and that he has ultimate control over the general conditions surrounding the apartment or apartment complex.